It all means the same thing: A Deep Hole in the Ground. Open pit mining is planned for the south area of the Centennial Project, the area closest to Fort Collins, Greeley, and Wellington. 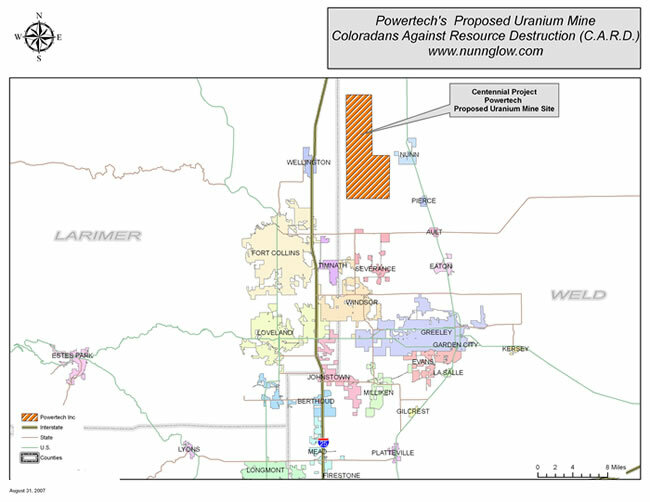 Powertech estimates the Centennial Project holds 9.7 million lbs of uranium. Over half the uranium, 5.9 million lbs, lies in shallow deposits within the southern area of the Centennial Project, the conventional (open-pit) mining area (see page 32 of http://www.powertechexposed.com/Centennial43-101.pdf). 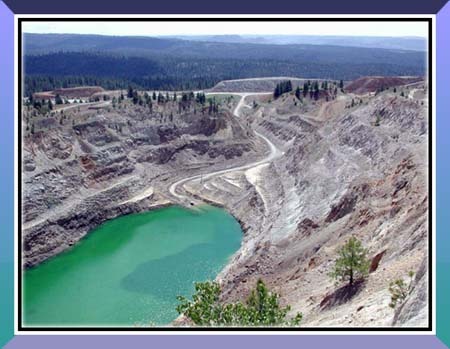 Open pit mining is used when deposits of uranium are considered close to the surface. Uranium deposits in the Centennial Project’s south area are at a depth of 80 to 120 feet with an average thickness of 9 feet. Mining to that depth would create a 129 foot hole in the ground, equivalent to a 12-story building. The average grade of the uranium in Centennial Project’s south area is only 0.1 %. This means 2.9 million tons of rock must be mined to remove the uranium. "The largest unavoidable energy cost associated with nuclear power relates to the processes of mining and milling uranium fuel. Variable grades of uranium ore exist at different mines around the world. A greater amount of energy is required to extract uranium from a mine containing a low-grade uranium concentration of 0.1% than from another mine containing a uranium concentration of 10%-ten times more. . .The energy used to mine the uranium is fossil fuel . . ."
The Sierra Club concurs with Dr. Caldicott and writes “Uranium mining is among the most carbon-dioxide-intensive operations in the world” (SierraClub.org). Since uranium was first located within the Centennial Project in 1980, the primary focus has been to surface mine the south area. Rocky Mountain Energy Company (RME), a subsidiary of Union Pacific Railroad and the original owner of the Centennial Project, not only planned to surface mine the south area, a plan still outlined in Powertech’s Centennial’s Projects Technical Report (43-101), RME also investigated vat leaching to extract uranium from surfaced mined ore as well as building an on-site uranium processing mill. RME dropped its plans for the Centennial project when market prices for uranium fell in 1982. At that time, it was also determined a gravel quarry would be an additional economic resource for moving the 7.9 million cubic yards of gravel that overlay the shallow uranium deposit. Powertech has already marked out their gravel pit in this same south area. 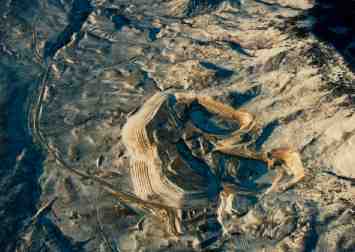 There is no U.S. regulatory agency that watches over gravel pit mining. Radioactive tailings from uranium mines are exposed to wind and rain where they are spread miles outside the mining operation. Scientist Dr. Gordon Edwards writes in a December 2007 article “When radon gas is released from a uranium mine, it deposits solid radioactive fallout – including polonium-210 – on the ground for hundreds of miles downwind of the mine site.” Those radioactive particles may travel even further from the Centennial site since Colorado has a ranking of 11th for best place in the nation to generate energy from the wind and Weld County ranks first in the United States for having the most tornados (www.coopext.colostate.edu). Colorado’s most populated areas of the state lie downwind from the proposed Centennial uranium mining project. Click here ( ) to see a map of wind directions and communites downwind from the Centennial Project. Peter Diehl writes in Uranium Mining and Milling Wastes: An Introduction: "All these piles threaten people and the environment after shut down of the mine due to their release of radon gas and seepage water containing radioactive and toxic materials." Mounds of mine tailings left from uranium’s last boom which ended in the 1980s continues to plague the United States. Because mining companies pulled out without sufficient cleanup and restoration, billions of dollars of taxpayers money has been spent in an attempt to do the impossible: return uranium mills and mining sites to a somewhat environmentally healthy state. An infamous example is Moab Utah’s Atlas uranium mill. Downstream from most of America’s uranium mines and mills sits Lake Mead, a huge reservoir that supplies drinking and irrigation water for southern California, Las Vegas, and parts of Arizona. The 40-year-old Atlas mill tailings pile at Moab, Utah, located 750 feet from the Colorado River, covers 130 acres and leaks on average 57,000 gallons per day of contaminated fluids into the river. The radioactive isotopes that are released in the mining and milling process have very long half-lives and are slowly making their way downriver into the sediments and water of the lake. The implications of a contaminated western water system are catastrophic. Polonium-210 is left over from uranium mines and found in tailings piles in concentrations where its radioactivity equals the uranium. Polonium-210 is a billion times more toxic than cyanide (http://pacificfreepress.com). Concentrated levels of selenium, vanadium, radium, molybdenum, nickel, cadmium and arsenic are also found in the tailings. While trace amounts of these heavy metals are not harmful, accumulation over time can cause serious illness in humans and animals. Plants that grow on uranium tailings show a high uranium uptake and have been determined to be a significant factor in the spread of radioactive material from these sites. Radium whose link to head and bone cancers and leukemia earned it the label of Superb Carcinogen from the British Columbia Medical Association, can leak from uranium tailings into the food chain and ground water for thousands of years (http://pacificfreepress.com). Selenium is an element commonly found in northern Colorado, often occurring in association with uranium. In areas were selenium is found in the surface soils, plants and grasses can become toxic to livestock due to the plants uptake of selenium. Selenium accumulator plants such as loco weed will move in and thrive in these soils and are know for acute poisioning and death to livestock (See Selenium Contamination). Uranium mining will concentrate selenium on the soils surface, either in open pit or in-sit leaching, making hot spots of selenium enriched plants, which can often be seen as greener than natural surroundings. The western United States has mountains of toxic uranium tailings exposed and unprotected from the environment. While restoration is a contracted requirement made before mining operations begin, there simply is no way to return a uranium-mining site to pre-mining conditions. It has become the norm for uranium mining companies to ask their required standards of reclamination be amended and lowered before they complete site restoration. Sites where these issues have occurred includes, but is not limited to: Bear Creek (Wyoming); Boots/Brown, (Texas); Bruni (Texas); Burns/Moser (Texas); Cañon City uranium mill (Colorado); Christensen Ranch (Wyoming); Clay West (Texas); Cotter (Colorado); Crow Butte (Nebraska); Highland (Wyoming); Irigaray (Wyoming); Hobson (Texas); Holiday - El Mesquite, Duval County (Texas); Kingsville Dome (Texas); Mt. Lucas (Texas); O'Hern (Texas); Palangana (Texas); Rosita (Texas); Smith Ranch (Wyoming); Tex-1 (Texas); West Cole (Texas); Western Nuclear Split Rock uranium mill site (Wyoming); Zamzow (Texas).